Week 3: I have been sent to earth to gain a body & be tested. Here is a DARLING idea for week 3 posted on the "Primary Singing Time Ideas for Leaders" blog. 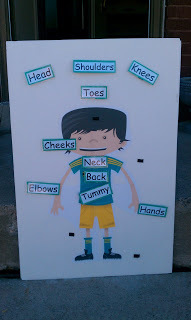 It incorporates the song "Head, Shoulders, Knees, & Toes". Here is the link to the post. Here are a few ideas for Valentine's Day. Play "hot potato" with a heart to determine who comes up. I found mine in the Target dollar section. The possibilities are endless. Have fun! Who doesn't love chocolate??? This activity is super fun & always a hit. Just be sure to have a candy alternative for those kiddos who are allergic to chocolate &/or nuts. Buy a box of chocolates & write numbers on the container underneath the chocolates. Assign a song to each number. Have a child come up & pick a piece of chocolate. Sing the song that corresponds. I found my mailbox in the Valentine's section at Target but I've also seen them at Michael's. Make valentine's cards & write songs for practice on them. Have a child come up & take a valentine out of the mailbox. Sing the song. Super simple!